FThe uniqueness of the combination of price, power, speed and design makes rich people line up for Lamborghini cars. The Lamborghini company for the fifty-year history has released a lot of models that have become legendary: Miura, Gallardo, Diablo, Murciélago. It is nice to imagine yourself in such a car, driving along the smooth roads or along a long highway. 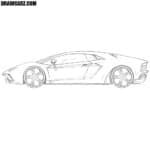 But it is quite difficult to buy such a car, but it is very simple to learn how to draw Lamborghini. The first step will be incredibly simple. 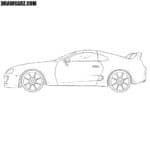 Here, with the help of coarse lines, you just need to depict the outline of the flat and long Lambo body by using light lines. 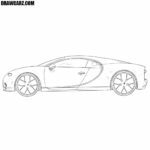 Now we depicture the outline of flat windows, rear-view mirrors, headlights and very large Lambo wheels. They can be drawn either with a compass or manually. In the third stage, we need to be more attentive. Clearly depict the front part of the Lambo on which are located the headlights and hood. 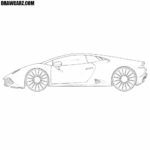 We depicture the upper part of the Lambo and its flat roof. 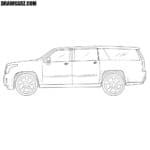 Add side mirrors and details in the outlines of a long and flat window. Draw out the taillights and very complex bumper. Depicture the lines as close as possible to what you see in the example. Now we will design a door – this model has one of them on each side. After that depicture the design lines of the Lamborghini. In this step, we will depicture the rims and tires of the Lambo. 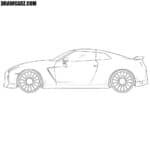 To do this, starting from the center, slowly draw each segment of the rims of the car, as you see in our drawing. 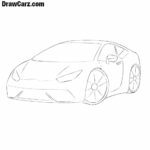 The drawing guide on how to draw a Lamborghini is almost done. In the last step, we draw hatching, also remove the extra lines. Did you know that the brand of Italian supercars Lamborghini is descended from agricultural machinery? Now the brand belongs to Volkswagen, and its “tractor” roots do not embarrass the rich all over the world. Circulations, as a rule, limited, almost any model of this legendary brand are bought up almost a year before the beginning of the production. 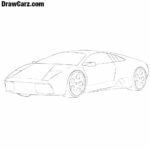 Thank you for visiting DrawCarz.com. Our team lives and is inspired by the legend of Lamborghini and other cool super cars. Every day we do our best to help our readers to improve their drawing skills.